Fold the paper in half downwards to make a rectangle. 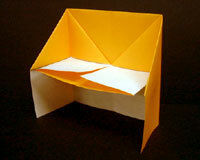 Make a line in the center of the paper by folding and then unfolding. Fold both sides in to meet at the center line. Swing one side of the paper out, opening the flap with your finger and folding it down to make a shape like the roof on a house. Fold the rectangular flap upward to meet the top edge. Fold the sides inward to meet at the middle. Open the sides again, making right angles with them, and fold down the "keyboard" into position.